The trail from White Mountain continues up the Fish River for another 2-2.5 miles to a large island. It makes a sharp left turn and starts overland. This turn should be well marked, since a trail continues up the river to Council also. One-fourth mile after leaving the river, a trail comes in from the right (also from Council) and this intersection should be well marked but can be confusing if snow machiners or mushers have departed from the trail. 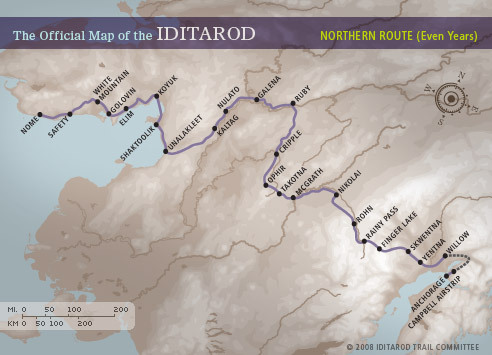 The Iditarod Trail crosses a series of low hills with moderate grades and starts through the Klokeblok River drainage. There is a little vegetation (willow) along some of the creeks. At Topkok, the trail turns sharply right along the coast. The Nome Kennel Club has a shelter cabin at the bottom of Topkok Hill. There is little in the way of visual references and each hill looks like the last. Wind often exceeds 40 knots. From Topkok, the trail follows the coast westward to Solomon, passing south of the actual village (near the Old Solomon village site). from here to Safety Roadhouse, the trail is the road. Safety — (SAF) Lat 64.27 Long 164.49 — The last checkpoint before Nome, just 22 miles away. Here the mushers are on the coast of the Bering Sea and travel on the beach most of the way to Nome.